…Or your own lying eyes? PR has its limits. You can only create so much belief in the face of a persistent, contradictory reality. 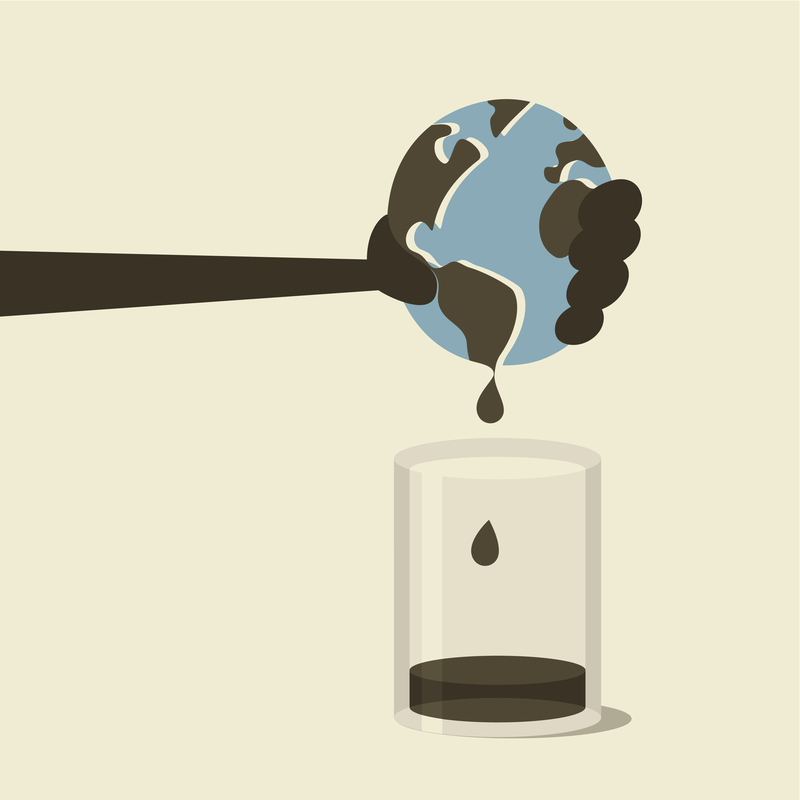 As the shale frenzy has bubbled along, stories about a United States and/or North American resurgence in oil production have been pushed in major media outlets from the Wall Street Journal to the New York Times and all manner of blogs in between. At the same time, domestic prices at the pump remain stubbornly aloft. Since economic “law” dictates that ample supply should result in lower prices rather than the upward trend we’re experiencing, there must be other factors at play, right? Anxiety over threats of war with Iran, commodity speculators, Big Government rules that hamstring drilling and the insatiable greed of Big Oil are all trotted out as the proximate cause of this seeming paradox. But for these transient, man-made issues, the storyline goes, we’d be swiftly on our way to Newt Gingrinch’s $2.50-or-less-a-gallon Promised Land. 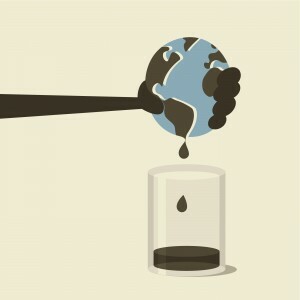 We are, after all, sitting on trillions of barrels of technically recoverable oil and 100 years of natural gas, right? Why are the world’s automakers hybridizing and electrifying their offerings? Why are major fleet operators looking to add electric, hybrid and compressed natural gas vehicles in increasing numbers? Why is the US military conducting major tests of alternative liquid fuels to power its ships, land vehicles, and planes? Why are major airlines conducting flight tests of planes with biofuels? Why has a major US airline moved to buy and operate a refinery? The actions by the organizations cited above are not inconsequential. They represent major commitments of money and effort, and, in the case of the auto companies, a major directional shift for their businesses. If energy independence and a gushing supply of oil were just a few more horizontally drilled and fracked wells away, would these entities really be pursuing strategies that hedged their futures increasingly away from reliance on petroleum? So, who are you going to believe; the hyped assurances of investment banks and oil companies, or your own lying eyes? Sustainable energy and personal rights are colliding over smart meters, those long-touted pillars of energy-saving smart grids, on the unlikely battleground of Vermont. Utilities and policy makers favor smart metering for its cost-cutting and energy-saving potential, but their entreaties are falling on granite ears in many quarters of the Green Mountain State. “Q. How are you this morning Mr. Smith? The Vermont smart meter conflict highlights a seldom-explored dimension of environmental sustainability – privacy. Like the siting of wind turbines, it’s an issue that sustainability advocates have to address if our energy consumption habits are going to change for the better. Smart meters and a smart grid are part of a future where technology helps us consume less energy. Energy efficiency advocates envision a future when sensors in energy-sucking appliances like water heaters can detect when they’re not used for long periods and automatically put themselves in a dormant mode. When refrigerators adjust their cooling levels according to how much food is on the shelves. When household energy management systems automatically reduce heating and cooling and turn off lights in rooms they sense are unoccupied. Smart metering and smart grids don’t reach nearly that far into ratepayers’ homes. They provide broad consumption data to support energy-saving measures like large-scale load balancing and variable rates to encourage off-peak usage. Nevertheless, they have a lot of people creeped out. Privacy advocates have pointed out that government and private companies could use data gathered by smart grids – to intrude on ratepayers’ lives. It’s not hard to intuit from energy use patterns when people are home and what they’re doing, even behind closed doors and drawn curtains, they say. The Vermont ACLU has joined with individuals and other advocacy groups in calling for tight restrictions on meter data. They also want a free opt-out of smart metering programs, unlike the paid opt-out that states like California have implemented. Smart-grid advocates in Vermont and California, where the same debate is raging, say the smart grid needs information to be smart, and if too many people opt out they won’t have enough. This is a problem, but it’s not a problem with smart grid technology per se. There’s nothing more intrinsically intrusive about smart meters than there is about surfing the Web or giving a credit card number over the phone. The problem is that consumers have had their privacy pockets picked too many times to accept assurances from utilities that their information will only be used to save energy. Vermont’s Green Mountain Power Company has devoted a section of its website to explaining consumer privacy protection around data collection. It points out where the company is constrained by existing utility laws and regulations, and that the meters can only measure a house’s overall electrical consumption, not individual appliances. Even so, the company is shoveling against an avalanche. Spam-choked email inboxes and dinner-hour robocalls have made consumers wary about who collects their information and what they can use it for. Like so many other pieces of the sustainability puzzle, this one needs government to put it in the proper place. Not all consumers will trust the government to protect their privacy any more than they trust private industry, but the weight of laws and regulations on their side is likely to win converts. Especially when they hear stories like Mike Butler’s and weigh the environmental upside. Privacy guarantees alone probably won’t carry the day for the smart grid. Privacy guarantees plus stories like Mike Butler’s just might. 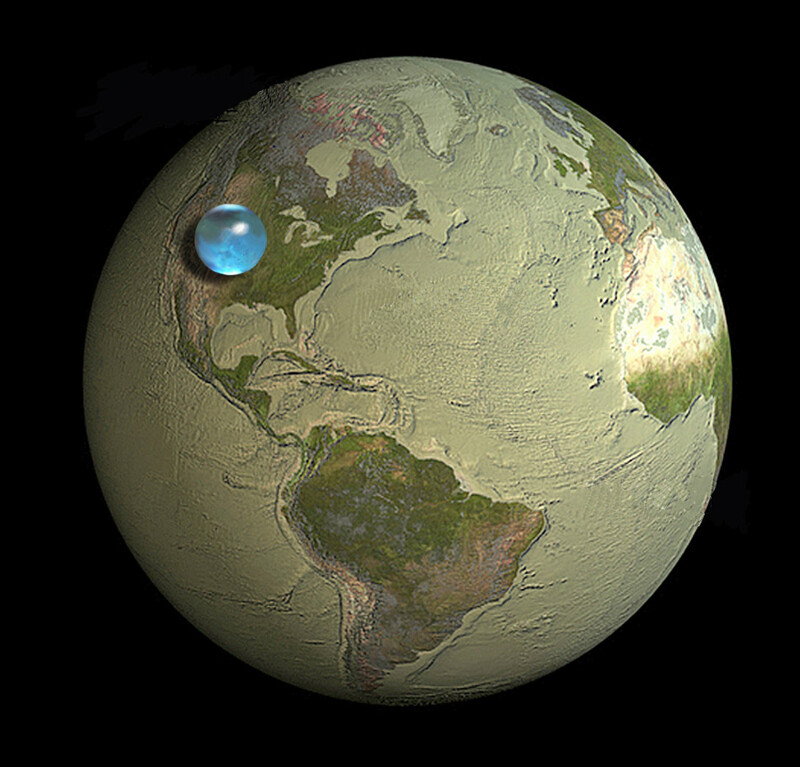 This image from the U.S. Geological Survey shows what all of the water on the Earth would look like if collected into a single sphere. Underscore ALL of the water: oceans, seas, lakes, rivers, underground aquifers, what’s in plants and animals, what’s in the coffee cup on your desk … everything. Makes you wonder why we make such a big deal out of oil, doesn’t it? If Earth Day is like a birthday for the planet, Climate Impacts Day is the ominous doctor visit. Aimed at spotlighting the nexus between climate change and extreme weather – e.g., drought, heat waves and torrential rains – tomorrow’s Climate Impacts Day is more about action than observance. Environmental advocacy organization 350.org urges everyone around the world to attend or start actions – rallies, presentations, art projects and more – that Connect the Dots between warming and weather for the mainstream media. Since talk is cheap and logic is overrated, the common visual thread will be, yes, dots – painted, formed by groups of people holding hands, shot from above, etc. – a gimmick intended to roll up into a powerful multimedia statement. Why the heck not dots, since boring old science doesn’t seem to prompt much action. “We’ll hold up a mirror to the planet and force people to come face-to-face with the ravages of climate change,” writes Bill McKibben, president and co-founder of 350.org. The organization predicts more than 1,000 Connect the Dots events in 100 countries. 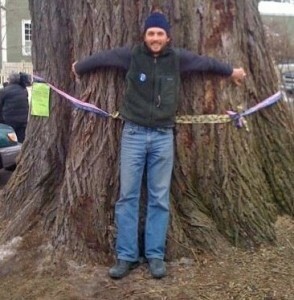 My neighbor Micum Davis, an arborist who can scale a tree as fast as any primate on the planet, will be attending one at the Portsmouth (NH) Farmer’s Market. Immediately afterward, he’ll invite participants to check out an urban garden he’s creating from a scruffy parking lot with his wife, Jennifer Wilhelm. Micum Davis is bringing positivity to the climate conversation. Got a dot you want to connect? Find a nearby event here.